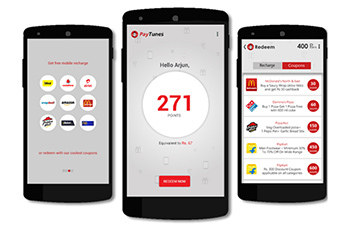 Mobile advertising platform PayTunes, operated by New Delhi-based Real Time Networks Pvt Ltd, has secured almost $500,000 (Rs 3.35 crore) in a pre-Series A funding round that was jointly led by existing investor CIO Angel Network and the Indian Angel Network (IAN). Apurva Parekh, executive director at Pidilite Industries Ltd, and serial entrepreneur-turned-angel investor Sanjay Mehta also put money in this round, PayTunes said in a statement. IAN members Vishal Khare and Rajeev Arora led this round of investment on behalf of the angel network and will join the company's board. The company said it plans to use the funding to hire sales and marketing staff. PayTunes had earlier raised $100,000 from CIO Angel Network in September 2015. PayTunes is an Android platform that helps brands reach their mobile consumers through audio ads. It replaces the ringtones of users' mobiles with ad jingles. In return, it allots reward points to users on every incoming call. Users can later redeem their points through free recharges and bill payments. The startup was founded in 2015 by IIT-Delhi alumni Divya Pratap Singh and Rakesh Sehgal, along with Gaurav Tiwari, who has previously worked in the consumer goods and IT sectors. Amit Naredi, former regional sales head in Mumbai for My FM, recently joined the company as a co-founder and chief sales officer. The company is working with about 25 advertising agencies and claims to have run campaigns for Nissan Motors, Vodafone, Saavan.com and Amazon, among others. PayTunes has a foothold in Delhi-NCR, Uttar Pradesh, Gujarat, Mumbai-Pune, Rajasthan and Bihar regions. IAN's most recent funding deals include investments in tech-enabled fashion startup 6Degree, Delhi-based city guide Little Black Book, entertainment firm Roast Media Pvt Ltd, which operates mobile entertainment app Roast and robotics startup SP Robotics Works.